The inaugural class of the Master of Science in Information Technology—Privacy Engineering (MSIT-PE) masters program completed their final degree requirements, presenting the results of their capstone projects. 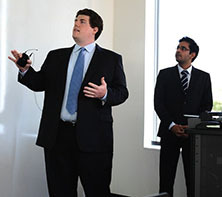 The eight graduating MSIT-PE students conducted their capstone projects over an eight-week period this summer, completing projects for three outside sponsors: American Express, Facebook, and Future of Privacy Forum. The American Express team developed and tested intuitive and simple privacy messaging and choices for American Express customers in a way that can re-enforce and support brand image and customer empowerment and engagement. The Facebook team developed a taxonomy of privacy notices that can be used by software developers and application designers to consider various trade-offs in designing a privacy notice. The team demonstrated the use of the taxonomy through several case studies. The Future of privacy Forum team explored tradeoffs associated with various approaches to enable consumers to opt-out easily from mobile location analytics. The team developed prototype implementations of two solutions: one involves logging onto a wireless network; the other uses a Faraday cage enclosure with built-in sensors to isolate and capture MAC addresses from devices. The MSIT-PE degree is a one-year program designed for computer scientists and engineers who wish to pursue careers as privacy engineers or technical privacy managers. Designed in close collaboration with industry and government, this program is intended for students who aspire to play a critical role in building privacy into future products, services, and processes. This first-of-its kind program responds to the rapidly growing need for technical privacy expertise. Offered jointly by the School of Computer Science and College of Engineering, the program is housed in the Institute for Software Research (ISR). In addition to the capstone project, the program includes two semesters of courses taught by leading academic privacy and security experts. The program is co-directed by ISR faculty members Lorrie Cranor and Norman Sadeh.